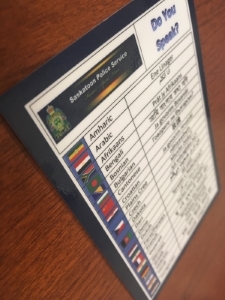 The Saskatoon Police Service, in partnership with Citizenship and Immigration Canada, has created an Interpreter Training for Policing program. This initiative is an effort to improve the quality and timeliness of interpreter services, to ensure Charter Rights are fully protected, and to support the effectiveness and efficiency of the justice system. It stems from the changing demographics of the city, as police officers encounter ever more police investigations requiring interpreters. Eighteen civilians participated in the initial offering of the training in 2011. They are fluent in both English and their native languages which include French, Arabic, Mandarin, Cantonese, Punjabi, Urdu, Vietnamese, Spanish, German, Russian, Bengali, Ukrainian, Japanese, Swahili, and Farsi. The first Interpreter Training for Policing class graduated on June 29, 2011. The training provided participants with information and education on interpretation skills, legal terminology and legal processes. It also offered participants an in-depth look at various specialized units within the service and the different types of investigations police officers complete. The Saskatoon Police Service recognizes the achievements of the first graduating class and the valuable services they will provide to our community. With the support from Citizenship and Immigration Canada (CIC), the Saskatoon Police Service offers this program to qualified applicants in Saskatoon. The goal of the program is to provide bilingual (or multilingual) participants with the skills and knowledge necessary for the delivery of effective interpreter services for the justice system in Saskatoon. All applicants who successfully complete the program will receive recognized Saskatoon Police Service Interpreter Certificates. All participants will also have the opportunity to be contracted by the Saskatoon Police Service to provide interpretation/translation services for its CIC funded video program and other police related work. The Saskatoon Police Service is currently accepting applications for the program. Please complete and submit an Interpreter Training Program Application. For further information, please contact the Cultural Resources Unit at cultural.resources@police.saskatoon.sk.ca.